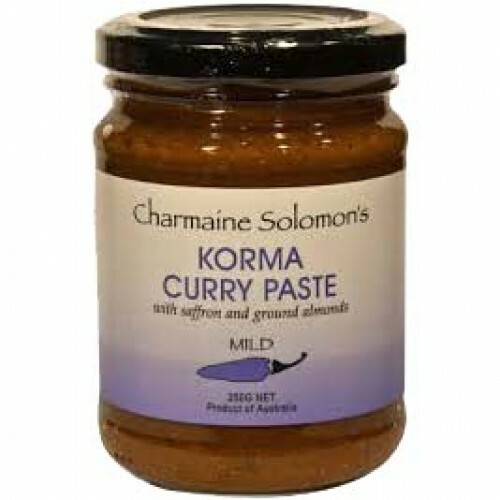 The mildest curry paste in the Charmain Solomon range, Charmaine Solomon's Korma Curry Paste is a combination of ground almonds, exotic spices and saffron makes a curry fit for a king. Delicious with lamb, chicken or fish. Serve with rice or roti and, if desired, sambols and chutneys. Medium. Korma, also spelled kormaa, qorma, khorma, or kurma, is a dish originating in South Asia or Central Asia. Classically, a korma is defined as a dish where meat or vegetables are braised with water, stock, and yogurt or cream added. Korma has its roots in the Mughlai cuisine of modern-day India and Pakistan. It is a characteristic Moghul dish which can be traced back to the 16th century and to the Mughal incursions into present-day Northern India, Pakistan and Bangladesh. Ingredients: A blend of onions, garlic, ginger, canola oil, spices, ground almonds, citric acid and saffron.